Yes, I bought The Black Eyed Peas album The E.N.D. (an acronym for the energy never dies) last year. It doesn't matter that I was practically shamed into buying some new music by a few of my unruly teenaged relatives (my dancing days apparently ended sometime in the 90's as all I had to play for them that one evening was Deee-Lite, House of Pain and Betty Boo). Worst of it was, I had absolutely no idea that kids today would find my music outdated. Wasn't I just one of them? Was I actually through busting a move, instead rapidly moving toward busting a hip? Sigh. Anyway, The E.N.D. is a really fun album with a lot to dance to. I even got my freekum dress on and bought Beyonce's B'day and I Am...Sasha Fierce albums (I mean cds) as well in case my beloved brats ever come to visit again. So the point of all this? The Peas are cuttin' loose, yo, and heading out on tour. What kind of facebook fan would I be if I didn't give a blog shout out to my peeps and feature the official Black Eyed Peas Cocktail sponsored by Bacardi--the Bacardi V.I.Pea! Now, I had heretofore never heard of black sugar, and would have only guessed that it may have been a single for Mr. Barry White or a vehicle for Ms. Pam Grier back in the 70s--but no, according to my reliable sources, black sugar is actually an ingredient found in Asian markets, rather common in Asian cookery, also used to partner with ginger in cups of tea, and believed to have restorative properties. Here, the Peas just drink it straight up with their Bacardi. 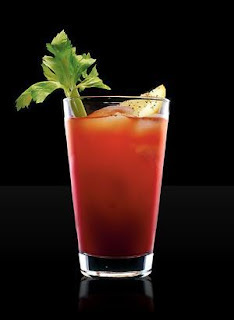 I gather that the garnish is entirely optional. Put all ingredients into a shaker, stir until the sugar has dissolved. Fill ½ cubed ice and ½ crushed ice and shake vigorously until chilled. 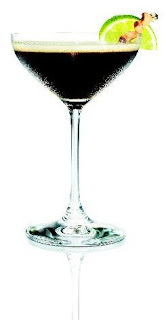 Double strain into a chilled or frozen coupette (more often used for holding margaritas) or cocktail glass. Having weathered the last two days of monsoon-like conditions while firmly ensconced downtown in jury duty waiting for a case to present itself, before we were finally sprung free I put down my book and crossword puzzles and began to imagine myself elsewhere, outside, where the rain had hopefully stopped, doing other patient, more pleasant things: I pictured myself shopping for groceries to make a dinner of brook trout, Lentilles du Puy and a simple but suitable salad, for Baby and me. Raised from my reverie, we were released early, around 230pm (as opposed to 5pm) and off I went, doing exactly as I had planned. Well, almost exactly. Although there was no longer a downpour outside, there was still a persistent mist. But it didn't warrant an umbrella. I caught an express train right away and was eating my brownie sample before I even realized I had done my service and was free of my jury duties. Although the counterman at The Lobster Place was indeed friendly, I was instantly thwarted. There was only one brook trout, he showed me, weighing less than a pound! 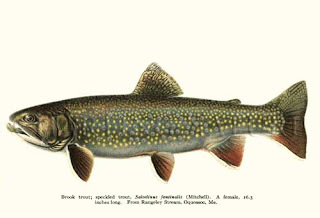 Why the heck was there such a run of brook trout today of all days? Still it was long-ish and could be shared decently enough, I guessed; I would shroud it in my hearty dish of Lentilles du Puy, making a wreath around the fish and dressing it up with some chopped beets for color. The dressing was a go (see below) for a loosely shredded head of Boston lettuce and if that still wasn't enough to eat for us, I remembered we had an unopened container of raspberry sorbet, recently purchased. While the lentils simmered in the oven, I made the salad dressing. Afterward, the trout cooked quickly on a grill pan with olive oil, a few sprays of lemon, and dashes of salt and pepper. 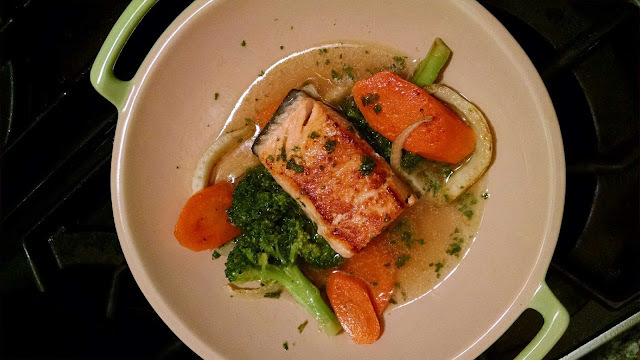 For a twist on tradition, make a court bouillon ahead of time and instead of poaching the fillets with this broth in the classic manner, whisk a few tablespoons of butter (one tablespoon at a time) into about a cup of the concentrated broth over low heat until thickened for a wonderful sauce to pour over the grilled fish. I hadn't worked from a grocery list, only well-intentioned memory, so I forgot that parsley goes in with the lentils too, along with more shallots than I had bought. It was of little matter though, because by the time Baby got home, it was nice just to have a homemade, comforting dinner on the table, one certainly that I'd had alot of time to think about! Mix lemon juice, mustard, sugar and shallot in a small container, preferably with a lid. Slowly whisk in oil to create and emulsion and add thyme. Flavor to taste with salt and pepper. Set aside for a bit until ready to use. When the salad is about to be served, put the lid on the container and really give it a good couple of shakes to revive the dressing and then drizzle judiciously over the salad, just coating the lettuce and mix together. In preparation for the eve of Pesach, the Jewish Passover holiday, Baby is invariably found making Sponge Cake! This tradition has been passed down to him by his mother and her mother before that. He even uses the same tube pan that they used (this device is actually made up of two pieces--the outer wall and the insert which is the center and base). Because there are no leavening agents used, the process is a little work-heavy, as it involves separating a dozen eggs, beating the yolks and whites separately and carefully folding the two together, but the results are lighter than air. Baby's suggestions and embellishments (and may I say improvements?) are in italics below. Beat yolks about 5 minutes. Add sugar gradually; add juice and wine, zest, almonds and a capful of almond extract. Add cake meal and potato starch which have been mixed together. Set aside. Beat whites with salt until it stands in peaks. Fold into the yolk mixture and bake in a 10 inch tube pan lined with wax paper. 350 degrees for 1 hour. Test - if toothpick comes out dry. May require additional 10-15 minutes. Turn upside down (inverting over a long, thin-necked bottle and let cool completely--this prevents cake from falling. Remove from bottle, gently loosen cake to remove from pan by using a spatula or thin knife to run around the pan). When cake has cooled, artfully arrange lemon slices and drizzle icing over top, quickly decorating with almond slivers before the icing sets. *Candied lemon: cut 10 thin slices of lemon on a mandoline. Blanche slices in simmering water for 60 seconds. Immediately place in an ice bath. Boil 1 cup sugar and 1 cup water, reduce heat and simmer lemon slices in one layer for one hour. Let cool on parchment paper. **Citrus icing: mix 1/2 cup confectioner's sugar with 1 Tb. reserved fruit juice and a few drops almond extract. When CSN Stores sent me the singularly-styled kiwi Le Creuset stoneware wok serving dish (also available in dijon, caribbean, cobalt and cherry--not shown) to review on Evenings With Peter, I immediately was impressed by its versatility: it may be used in the oven (up to 500 degrees) to create dishes or thaw frozen ones, is suitable for the microwave, under the broiler, and is even dishwasher safe. In my mind I had visions of serving Asian-inspired creations or an evening of various pasta courses to a host of friends--but just recently I received an even more exciting tip from the Tipsy Parson, a hot new restaurant right here in Chelsea, and I realized that the Le Creuset wok is perfect to serve a relatively simple entree, just for two. Below is a basic sketch, I leave the rest to your imagination and the flicker of a little candlelight. Bring stock to a boil, lower heat and add in Parmesan rind and simmer until a slightly creamy, thickened consistency is achieved. In the meantime, pulse the mint and watercress in food processor with a dash of salt and pepper, drizzle a touch of oil through the food tube to create an emulsion and set aside. This is your pistou as the French call it, or pesto via the Italians. Gently saute your vegetables in butter until softened: thinly slice the fennel perhaps, cube the carrots, mince the garlic, release the peas from their shell, keeping them whole, as with the beans. Salt and pepper to taste. Remove the rind from the broth mixture and whisk in a tablespoon of butter. Carefully pour into the wok serving dish. Place fish in the center and dress with the vegetables. Stir the pistou and then swirl a little into the broth and serve. Do enjoy and don't forget to check out CSN Stores and their other websites too: the company offers links to more than 200 web sites featuring cookware, modern furniture, kids bedding and an almost endless supply of more great stuff! 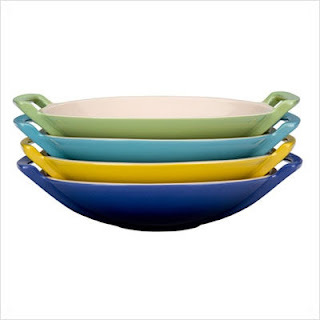 Everything But The...Le Creuset Wok, Part One! Isn't she a beaut? 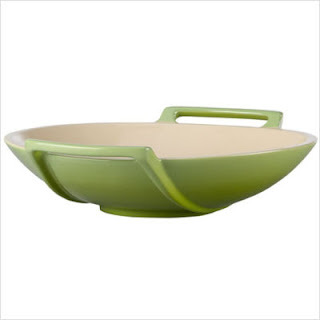 CSN Stores generously donated a stunning Le Creuset kiwi-colored wok to Evenings With Peter for a review. The company has more than 200 web sites featuring cookware, modern furniture, and kids bedding (Baby and I are already plotting out coverlets and sheet sets to give to our nieces and nephews for birthdays and holidays!) among a vast selection of other great merchandise. Apart from planning to try our hand at some Chinese dishes to serve in our wok, we also think it would be wonderful to use as a platter for pasta and leave it on the dining table as a beautiful centerpiece. Oh sole mio! Sole is so simple--yet so frustrating! It certainly should be as easy as each recipe I look at claims it to be. Previously, I'd dallied with the fish for guests, the results sometimes good, sometimes not. Ina Garten's "Easy Sole Meuniere" recipe is simple in theory, but there are a few unexplained things that I have to still thoroughly determine, regarding the proper saute pan, level of heat to cook the fish (both resulted in the fish not panning out the way I hoped it would), the correct butter (we used our own this time out). The recipe says to use filets 3-4 oz. each which we did, but the filets also need to be thick. Ours were too thin. The reason why to use thick filets is that sole is a very delicate fish and the first batch fell apart instead of holding firm. The second batch fared better. The problem with many recipes is that the authors rarely explain the "why" about anything. So what did I learn? Well, I used a pan that I loved, but it was the wrong pan: the sides were too high, the temperature not high enough and as I mentioned, the sole filets too thin (but you could hardly blame us, they were on sale at Whole Foods, though hardly a bargain after all). Use a long, wide rubber spatula, it's hard to negotiate flipping the fish with a metal spatula. 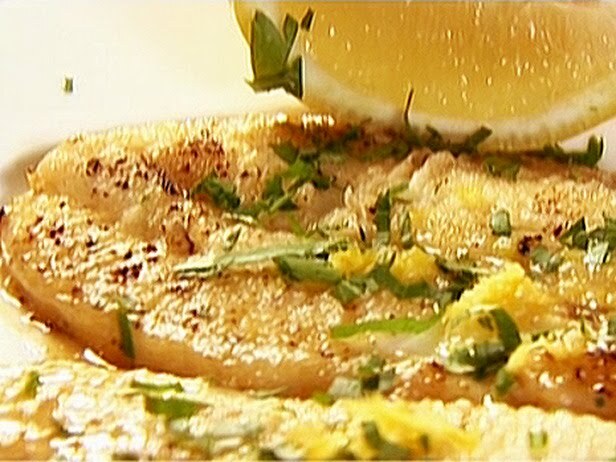 I also didn't have enough sauce at the end to pour over the fish and had to add more butter and lemon into the pan at the last minute to finish the fish--I used too much fresh lemon juice. That's it. We had a decent dinner just the same, with a side of Celery Victor and a few glasses of a lush German clemensbush riesling with a gentle complexity. Stay posted for the next (hopefully less disappointing) sole installment. As one is often found in a French market with some time on hand, a few randy Euros, and an ounce of inquisitiveness, Ina posits, "One day in Paris, I decided to challenge myself and just go to the market with no menu in mind. Dover sole was in season and I thought, 'Well, I can make sole meuniere without a recipe, can't I?' Yes, I could! I was shocked by how easy and delicious it was. Of course, Dover sole is the best, but you can certainly use gray sole fillets from any fish store. The slightly burnt butter and the fresh lemon zest give this dish a big fresh lemon flavor. I serve two fillets per person." "Preheat the oven to 200 degrees. Have 2 heat-proof dinner plates ready. Heat 3 tablesoons of the butter in a large (12 inch) saute pan over medium heat until it starts to brown. Dredge 2 sole fillets in the seasoned flour on both sides and place them in the hot butter. Lower the heat to medium-low and cook for 2 minutes. Turn carefully with a metal spatula and cook for 2 minutes on the other side. while the second side cooks, add 1/2 teaspoon of the lemon zest and 3 tablespoons of the lemon juice to the pan. Carefully put the fish fillets on the ovenproof plates and pour the sauce over them. Keep the cooked fillets warm in the oven while you repeat the process with the remaining 2 fillets. When they're done, add the cooked fillets to the plates in the oven. Sprinkle with the parsley, salt, and pepper and serve immediately. Note: Zest the lemons with a rasp before you squeeze them for their juice. This dish cooks quickly so I prepare all the ingredients before I start cooking." Copyright © 2008 by Ina Garten. Photographs copyright © 2008 by Quentin Bacon. Reprinted From Back to Basics with permission from Clarkson Potter/Publishers. Our dear friend was incredibly kind and thoughtful to have given us this wonderful Frittata Pan from Williams-Sonoma as a housewarming gift. First time out I fried up some bacon and then sauteed a chopped onion in the deep half before adding in a blend of shredded Monterey Jack and Colby cheeses that I had stirred into three whisked eggs with a little milk, salt, and pepper. After the eggs were beginning to set, I lightly brushed olive oil in the shallow half of the pan, and then put it upside down on the deeper pan and flipped it, allowing it all to set further, cooking for a few minutes more. And voila! Here we have a perfect frittata! Below is the recipe from Williams-Sonoma for the somewhat more adventurous Butchers' Breakfast Frittata, which I used as a guideline for the simple frittata I made by my lonesome. This is a great one-shot deal, ideal for serving a hungry bunch at brunch. In a bowl, whisk the eggs, then stir in the cheese, salt and pepper. Set aside. In the deep half of a frittata pan over medium-high heat, warm the 1 Tbs. olive oil. Add the mushrooms and cook until golden and tender, 3 to 4 minutes. Transfer the mushrooms to the egg mixture. In the same pan over medium-high heat, cook the sausage until browned and cooked through, 5 to 6 minutes. Add the ham and cook until heated through, about 2 minutes. Reduce the heat to medium, add the green onions and cook until tender, 1 to 2 minutes. Add the egg mixture and cook, using a rubber spatula to lift the cooked edges and allow the uncooked eggs to flow underneath, about 2 minutes. Continue cooking until the eggs are just beginning to set, 4 to 6 minutes more. Lightly brush the shallow half of the frittata pan with olive oil and heat over medium heat. 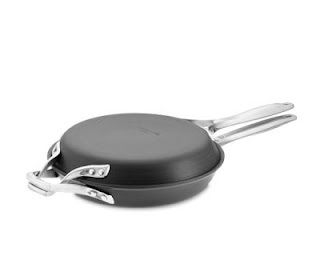 Place the shallow pan upside down on top of the deep pan and flip the frittata into the shallow pan. Cook, covered, until the eggs are set, about 6 minutes. Gently shake the pan to loosen the frittata and slide it onto a serving plate. While the weather was making up its mind whether to keep raining or give us some sun as ominous, Stephen King-like dark clouds threatened the sky uptown, I began to sort out the freezer. And what to my wandering eyes should appear? A nip of Absolut Peppar vodka! Well, grabbing the little bottle, I left the freezer task behind and set out a jar of Maille cornichons (French style gherkins) and cocktail onions on the kitchen counter, along with a container of pitted garlicky Mt. Athos olives from Whole Foods and artfully punctured a few of these items with a knotted bamboo skewer (always good to have on hand) to compose a garnish for my Sunday Bloody Mary! I moisted the rim of a tall glass with a lemon wedge, and then rolled it in an equal parts mixture (1/2 tsp each will do) of Five Spice Powder and Celery Salt before putting a bunch of ice in the glass and pouring in the vodka. I added most of the contents of a 5.5 oz can of Campbell's tomato juice, squeezed another wedge of lemon, squirted some lime juice from a plastic lime and a few dashes of Lea & Perrins Worcestershire sauce. A few grinds of fresh black pepper went in too and after a few stirs with a stalk of celery, it still felt a little flat. I knew it needed horseradish but regrettably, I discovered our jar of Gold's grated prepared horseradish expired last year--so I grated a clove of garlic with a microplaner and it absolutely did the trick. Blasphemous? Not sure. But we do what we can in a pinch. As Diana Vreeland replied to an airline hostess who had just informed her that they couldn't fulfill her request for Apple Brown Betty as they didn't have any on the plane, she commanded, "Fake it!" Today marks the first anniversary of my food blog, Evenings With Peter! For my first entry a year ago, I made Julia Child's cassoulet; the process consuming, spreading over several days, the results uproarious! 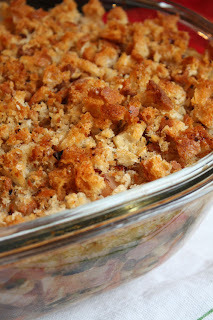 This year I wanted to commemorate all this blogging by featuring another, simpler one day affair cassoulet from cooking.com that I had first made about ten years ago. Sometimes I think if Baby and I had to choose, we would rather just have a big freezer instead of a refrigerator--we freeze everything, from homemade veal and lobster stocks to ready-made pie crusts, venison steaks, sea bass fillets, chicken breasts, ground pork, and pork bones for soup, tomato sauces, legs of duck confit and Polish boczek. So much came in handy when we rooted through our carefully stocked cupboards and freezer, wanting to use as much as we already had on hand to make this ultimately easy and oh-so rewarding cassoulet, richly layered in flavors and textures. We didn't soak our beans overnight, opting for canned instead, added toward the end, which I think works just fine, as there's enough else going on here. We thawed veal stock, a leg of duck confit, and used a pork bone for flavor instead of a smoked ham hock--boczek subbed for pancetta here and added the vital smokiness we would have otherwise gotten from the ham hock. Two heads of garlic, an onion, cloves, 1 dry cube each of vegetable and bouquet garni stock, and a few cans of white cannellini beans were pulled from the larder, along with a cup of crushed tomatoes from another can (instead of two quartered tomatoes that the recipe suggested). We ended up buying only 2 lbs. boneless cubed lamb shoulder, 1 lb. cooked pork sausage, a carrot and two celery stalks to complete our cassoulet, topped with a homemade stash of bread crumbs, 1/2 cup sprinkled upon the proceedings just before everything goes into a preheated 400 degree oven. There was an unopened bottle of a dry white French Frederic Mallo riesling in our refrigerator, so we used a cup to deglaze the pan and simmered the lamb with more veal stock (thereby removing the gaminess from the lamb)--the balance of the excellent, heady vino accompanied our hearty dinner. Although the cassoulet may be served after the few hours it takes in preparation, plan ahead and be patient (despite the great ribbons of aroma undulating about the kitchen). Let it cool down and keep the dish in the refrigerator for a day or two before reheating over a low flame stovetop and serving. We will eat this for days--and of course freeze whatever is left over. If I may say so, Happy Anniversary, Evenings With Peter! Thanks to folks for reading! Without any grand entry, I have to say that this chili is just marvelous, and so comforting to eat during any part of the day in the midst of all the wicked weather. I used to take chili recipes and sub ground chicken for the beef on occasion, but this particular recipe is meant to be made with chicken and actually enhances the flavor with the subtle nuance of fennel seeds and the sweetness of corn. Swiss chard is indeed a gem but as the market was fresh out, I used thick slices of sturdy escarole as an ample replacement, and it worked very well (much easier too than the exhausting business of separating the stems of the chard to get to its leaves!). The chicken chili was delicious straightaway, fragrant and steaming hot out of one of my favorite Le Creuset flame-colored Dutch ovens, ready to serve in about an hour, but I suggest making it ahead of time, letting cool completely and then refrigerate as it gets even better after a day or two. 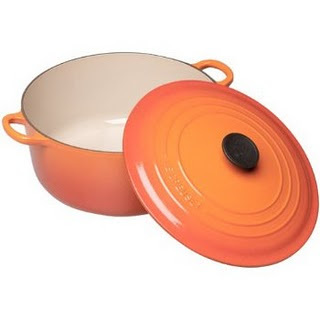 In a large heavy-bottomed saucepan or Dutch oven, heat the oil over medium-high heat. Add the onion and cook until translucent, about 5 minutes. Add the garlic and cook for 30 seconds. Add the ground chicken, 1 teaspoon salt, cumin, fennel seeds, oregano, and chili powder. Cook, stirring frequently, until the chicken is cooked through, about 8 minutes. Stir the flour into the chicken mixture. Add the beans, Swiss chard, corn, and chicken stock. Bring the mixture to a simmer, scraping up the brown bits that cling to the bottom of the pan with a wooden spoon. Simmer for 55-60 minutes until the liquid has reduced by about half and the chili has thickened. Add the red pepper flakes and simmer for another 10 minutes. Season with salt and pepper, to taste.